I mentioned in my post yesterday that one of the family traditions we’ve changed from my growing up is having breakfast during the present unwrapping. It’s nice to take a break part way through the unwrapping festivities for some real food (rather than just eating Reese’s peanut butter cups or tic-tacs from your stocking until lunch time and then feeling vaguely ill for the rest of the day). Of course, my children are always anxious to get back to the presents, and I don’t want to spend a long time getting breakfast ready, so I always try to have it be a pretty quick and easy breakfast while still feeling festive. 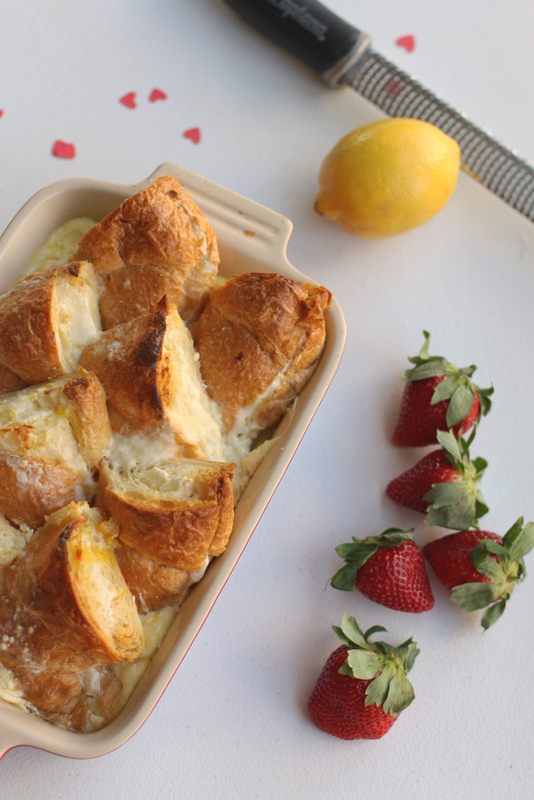 This make-ahead croissant french toast casserole is PERFECT. I can get it all ready to go the night before, including making the strawberry sauce and keeping it in the fridge, and then when we start opening presents, I can pop it in the oven and when the timer goes off, I warm up the sauce, pull out some juice and eggnog and breakfast is served. If I’m feeling very fancy, I might fry up some bacon or make a quick smoothie. 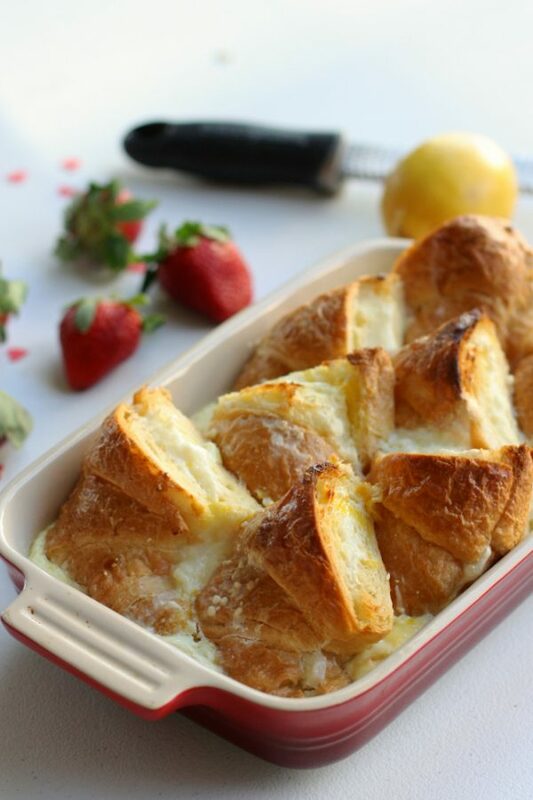 I pretty much never met a croissant in any form that I didn’t like, and this is a REALLY good use of them, especially for our family that all loves cream cheese with all their hearts. Plus, when you can pick a lemon right off your lemon tree, it’s even better. If only we had a strawberry plant that wanted to produce fruit in December (or, you know, a strawberry plant at all). If you make it for the holidays, I hope you and the rest of your family love it! But if you’d rather just have a breakfast of stocking candy, I won’t judge you for it. Cut the croissants in half and then split open (like you’re making a sandwich). Set aside. 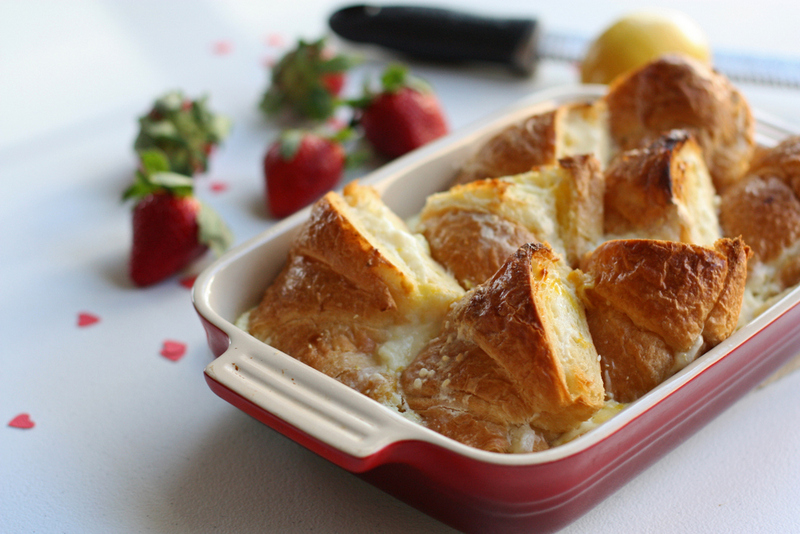 Spread the cream cheese mixture over each half of the croissants and then put the tops and bottoms back together. Arrange the pieces evenly in a baking dish (mine is about a 5×9). So the lemon in the milk doesn’t curdle? Or it does and doesn’t matter? It’s never been a problem for me – it’s basically making it a bit more like buttermilk.